Hawthorne (United States) (AFP) - Tesla introduced a new electric sports utility vehicle slightly bigger and more expensive than its Model 3, pitched as an electric car for the masses. Deliveries were expected to begin late next year for the higher-priced Model Y vehicles, with the standard-range version likely get to buyers by spring of 2021, according to Tesla. Musk said the Model Y has "the functionality of an SUV but it will ride like a sports car" accelerating from stand-still to 60 mph in 3.5 seconds. Model Y featured a "panoramic glass roof" and could seat seven people, according to Musk. Entry-level SUVs are a hot segment of the vehicle market. "Even though the Model Y will debut with promises of grandeur, if there are any chinks in Tesla’s brand armor, this vehicle will expose them," said Edmunds executive director of industry analysis Jessica Caldwell. "Tesla is about to learn exactly what it means to go head-to-head with the German automakers." While Tesla has a devoted fan base, with people at the Thursday event shouting enthusiastically for Musk, the Model Y will be competing with attractive SUVs that titans such as BMW, Mercedes and Audi are bringing to market, according to Caldwell. 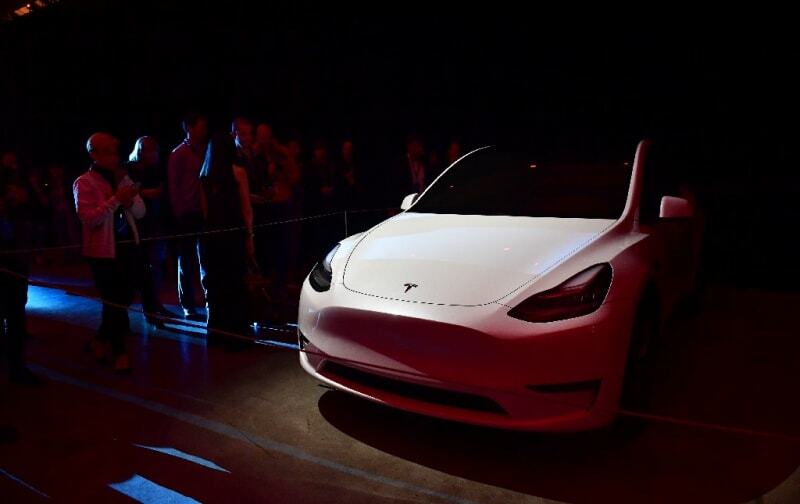 The latest addition to the Tesla line-up comes shortly after the California-based company rolled out its lowest-priced Model 3, an electric car designed for the masses, at a base price of $35,000, with deliveries promised in one month. At that price, the Model 3 is less than half the cost of most Tesla on the road and may be eligible for tax incentives which could further lower ownership costs. "If Tesla truly wants to be a mainstream brand, it's going to have to figure out how to sell cars to people besides young men in California," Caldwell said. Tesla has a sound foundation for the Model Y to be a "turning point," since it has an enviably young base of buyers for a luxury brand and the Model X has had strong appeal to women, according to Caldwell. The new vehicles suggest Tesla has been able to overcome production bottlenecks to ramp up production to meet demand, and moving toward Musk's goal of making electric vehicles widely available. Tesla this week reversed course on its decision to move most of its sales online, saying it will keep many of its showrooms open -- but will need to hike prices to do so. Tesla made the announcement on February 28 that it would begin selling its mass-market Model 3 at the promised $35,000 price, and close most of its retail locations to cut costs. But the company said that after review, it had decided to keep some of its showrooms, although the specifics were not disclosed. Tesla said the price hikes would start on March 18 for "the more expensive variants of Model 3, as well as Model S and X." "To be clear, all sales worldwide will still be done online, in that potential Tesla owners coming in to stores will simply be shown how to order a Tesla on their phone in a few minutes," the statement added.